HRH The Princess Royal paid visits to 1 Reg and DEMS on 2 May in her capacity as Colonel in Chief of The Royal Logistic Corps. HRH, The Princess Royal, arrived by helicopter and was met by the Master General of Logistics, Lt Gen M Poffley and the Corps Col CJ Francis before being driven to the Officers’ Mess for an official group photograph. Following the photograph, HRH spoke to the officers and their families prior to presenting the Imperial Service Medal to long-standing Quartermaster’s Clerk, Elizabeth Williams. Elizabeth, who lives nearby in Bicester, has worked at the barracks for many years serving 1 Regt and the previous residents, 23 Pioneer Regt. During her visit, Princess Anne toured cultural stands depicting the wide ethnic diversity of personnel serving within the Regiment and Corps, these included those with Afro Caribbean, Fijian, Nepalese and Indian heritage. Here she had the opportunity to taste a variety of different foods, receive a brief history of the countries represented and more importantly was able to speak with soldiers from those countries. 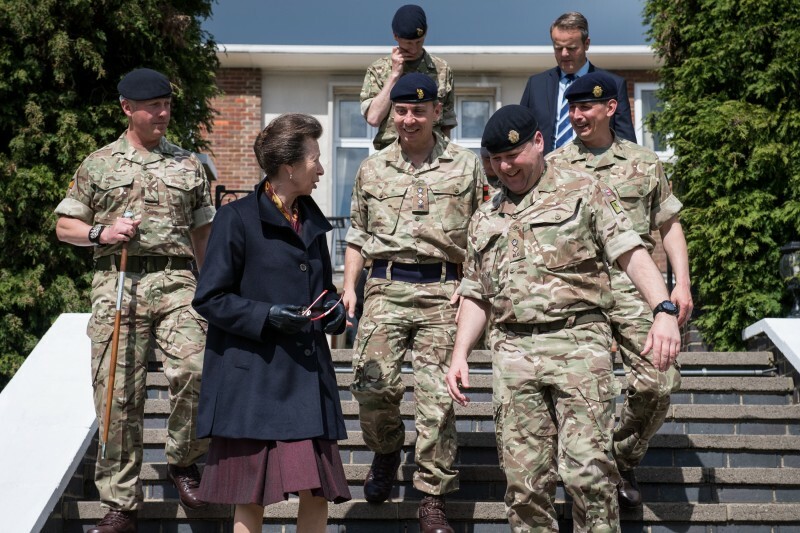 Princess Anne was also given an insight into the Regt’s operational capabilities. Among the many pieces of kit and equipment HRH got the opportunity to experience, the Protected Mobility Mastiff and CST were on point. HRH The Princess Royal’s visit culminated with a visit to the Warrant Officers’ and Sergeants’ Mess. Whilst here, she met Mess members and their families before being presented with a silver rhino (the Regt’s insignia) by six-year-old Finlay Evans, who is the son of the Regt’s Second in Command, Maj N Evans. Eight-year-old Keira Ward, the daughter of Sergeant Ward, also presented a posy of flowers to the Princess shortly before she left. All in all, it offered a great chance for soldiers and their families to meet HRH and allowed the chain of command to thank soldiers for their commitment and dedication. The Col-in-Chief’s last visit to DEMS was to the newly refurbished site in Bicester, in Jul 13. Her last visit to Kineton was to the Army School of Ammunition in 2008. This year’s visit brought elements from all four Sqn’s together, each delivering a dedicated display stand to showcase the diversity of the training offered by DEMS. The Master General of Logistics, the Lord Lieutenant of Warwickshire and the Corps Col joined HRH for the visit, which kicked off a visit to the Munitions Sqn where the OC, Maj C Saunders, discussed the variety of courses taught by his staff. Maj Saunders introduced HRH to instructors and students from the Ammunition Technician and Technical Officer Class courses. The visit then moved to the Felix training area where IEDD Sqn, under the command of Maj M Tennant, gave a brief on the mechanics of a UK IEDD task, 400 of which are conducted each year in the UK by 11 EOD Regt in support of the Civil Powers. The visit then moved on to CMD Sqn, where the OC Maj I â€˜Mack’ Mackintosh RE introduced HRH to his Tri-Service team of instructors, which now includes two RLC AT SNCOs. 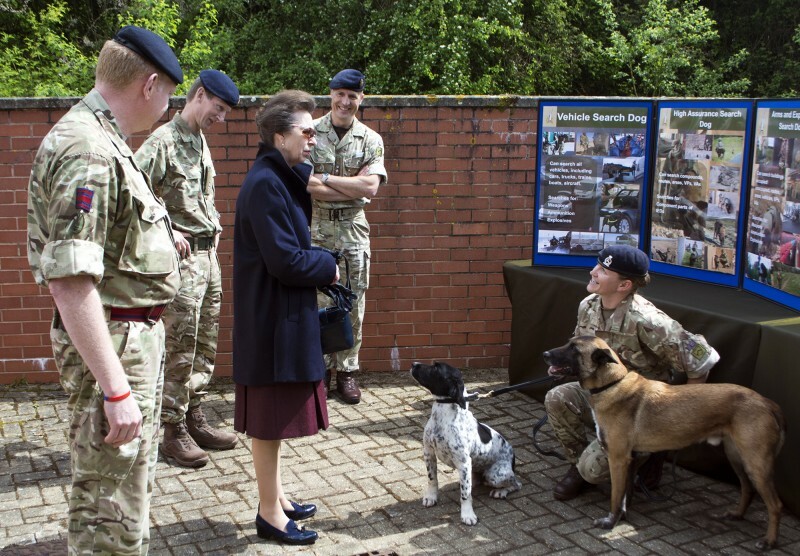 Search Sqn continued the theme of diversity with demonstrations from RE Search instructors, a Ground-Sign Awareness (GSA) brief from CSgt M McGrath PARA and a brief from its Military Working Dog handler Cpl R Mather who, along with her Malinois â€˜Qmelk’ were present for The Princess’ previous visit to DEMS in 2013. The final display was at the demolition ground where HRH was given a live demonstration from the safety of the armoured â€˜splinterproof â€˜shelter. Upon conclusion of the demonstrations, HRH was invited to the Officers’ Mess, where she was greeted by pupils from the neighbouring Temple Herdewyke Primary School, some of whom are children of DEMS Trg Regt staff. HRH retired to the Mess for lunch, after which she was presented with a framed fragment of the German Sprengbombe Cylindrisch 250 (SC-250) high explosive bomb that was discovered in Bermondsey in 2015 and was the first disposed of by a RLC EOD operator.